LED lights make this five-foot long red leash light up so you and your pet can be more visible while enjoying the great outdoors. 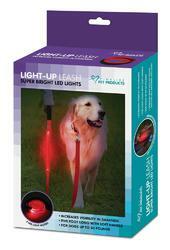 It has a soft handle, 3 LED light modes and is best for dogs up to 80 pounds. Operates with two 3V CR2032 button cell batteries (included). Weight 0.5 pounds. 60" x 0" x 0". Metal, Polyester, Plastic. UPC Number: 841437109719.